.NET celebrated its ten year birthday earlier this year. 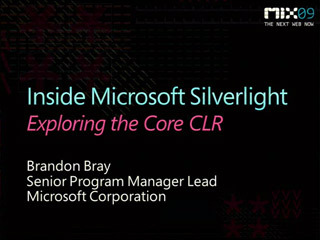 In this talk, we’ll explore the technology and industry trends that have driven .NET’s evolution. We’ll cover support for new platforms, advancements in application performance, and support for emerging application architectures. how can i know if its finished ? While this talk was well presented, it didn't really have any futures in it, and certainly wasn't 'advanced' in any way. Don't get me wrong, Brandon is awesome. The demo app was very good, and everything was accurate, but <yawn />. With WinRT on Win8, NET seems redundant on windows - for legacy apps only. It still has a place in the cloud though. The lack of any specifics on .NET's future was very disappointing. I thought Herb Sutter's "The Future of C++" put this talk to shame. Evolution of .NET? Just compare the number of sessions on C# and VB.NET to the sessions on C++. This talk should have been titled as "End of .NET"
I'm just starting, or better, trying to start learning something that will let me code some personal project on Windows. I don't know C++ and I don't even know C#.. and, as Amit said, it just looks like the future speak C++. I feel like lost with no clear path to follow for develop on Windows for Windows, excluding C++. I don't want to hear doom and gloom of .NET. I love the C# language and .NET. I would hate to see it go. I'm disappointed. This guy said nothing new at all! Watching is waste of time.